I am so sorry and heartbroken that this happened to you and your partner Officer Ramos. You are very important to New York, and the job you did was so important. We all grieve for you. We have all shed tears over the horrible way you and your partner were killed. I pray for you, your wife, and your family. I have thought about you and your partner every day, and I hope you are in a place where you feel peace and love. Rest in Peace, my brother of the Badge! God Bless your family, friends and Department. I support all our police. 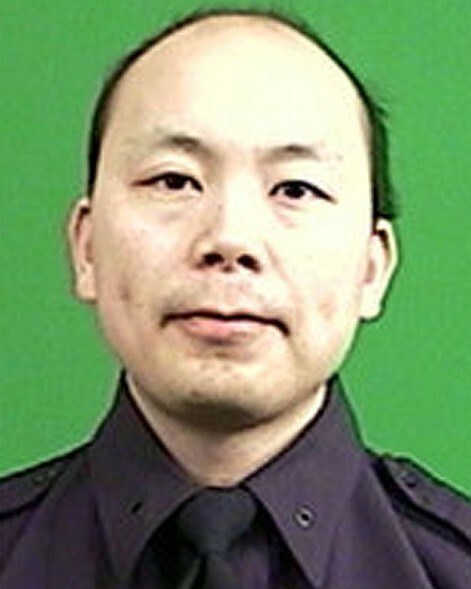 May Officer Liu rest in peace. Thank you for your service to keep the rest of us safe. Our thoughts and prayers are with you and the men and women of NYPD. May they rest in peace. My sincere condolences, my thoughts are with the family and the NYPD. You have the thoughts and prayers of all decent law abiding Americans. I don't know how to say thank you. My deepest sympathies on your loss. May God be with you. Thank you for your ultimate sacrifice brother. May the Lord welcome you into his mighty kingdom with open arms. Watch over us as we stand watch. Prayers to your family and loved ones. You pay the ultimate sacrifice!!! THANK YOU!!!!!!! the Coward is gone and your memory will live on. My wife and me are police officer. You have given your all and paid the ultimate price to keep us all safe. We now pray for your family who has to stay behind and pick up the pieces. May GOD watch over them and give them the strength to carry on your bravery. Say hello to my son Brian EOW 2014 I'm sure he will show you the ropes. My condolences to friends, family and the New York Police Department. Rest in Peace Brother. My thoughts and prayers are with your immediate family and your family in Blue!!! You will never be forgotten!!!! Loosing one brother is hard. Two at one time is unbearable; however, it is how both Officer Liu and Officer Ramos lived and worked will allow their fellow Law Enforcement Officers to carry on. Really sad to hear that. I'm also a police officer, in France. My sincere condolences to family and colleagues. Rest in peace officer, sincères condoléances to family, friends and NYPD. We think about you all, in these though moments! No words can replace your family member. Rest in peace Officer Liu. You will forever be remembered as a hero by your family, LEO Brothers, and God. Police Officer Wenjian Liu - may God bless you and your family. New York is sadden by your passing. We will all miss you terribly. Stay strong, your brothers from Québec, Canada are with you.